If you're an HRH, you may as well live like one. 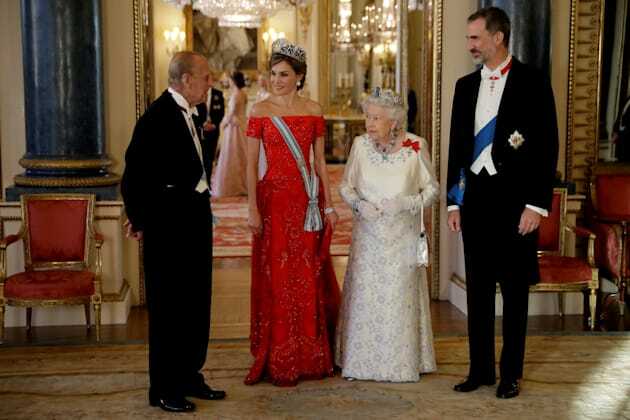 On Wednesday evening, the Duchess of Cambridge seemed to have emptied the royal vaults while attending the Queen's state banquet honouring the Spanish royals at Buckingham Palace. To mark the visit of King Felipe and Queen Letizia of Spain, Kate Middleton decked herself out in gorgeous jewels, including a ruby necklace, which was loaned to her from the Queen, a pair of pearl drop earrings, and a diamond tiara, which once belonged to Princess Diana. And what does a duchess wear with royal jewels? A dress designed by Hollywood royalty, of course! Middleton looked elegant in a dusty pink lace dress by Marchesa, a brand worn by A-listers all over the red carpet and co-designed by Londoner Georgina Chapman, who's married to Hollywood producer Harvey Weinstein. The dress is a bit of a departure for the duchess, who's known for wearing fairly conservative outfits. But the 35-year-old mom-of-two must have been feeling herself last night, as the Marchesa dress featured a plunging neckline and hints of skin under sheer fabric. Maybe Kate was hoping to impress Queen Letizia, who wore an off-the-shoulder red beaded gown by Spanish brand Loewe. There's nothing we love more than a royal sartorial stand-off!